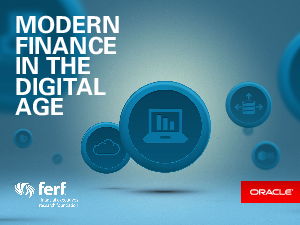 Modern Finance in the Digital Age is a research report commissioned by Oracle in collaboration with Financial Executives Research Foundation (FERF), the research affiliate of Financial Executives International. The report explores the new finance best practices CFOs are adopting in the Digital Age to create modern finance organizations better equipped to support more agile, technology-enabled business models and stronger C-suite collaboration. The research was shaped by in-depth interviews with over 20 leading CFOs, finance executives, and third-party experts from across all major global geographies.